Open at 9:00 a.m. on the 1st business day of February each year. By phone only. Phone numbers are listed below. If one telephone number is listed, this is the year-round number to call. If two numbers are listed, the first (off-season number) is the number to call beginning in February. The second number listed is the in-season number and a date is listed for when it replaces the off-season phone number. Details are in chart form below. 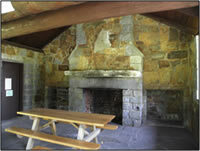 First come, first serve picnic areas are available at many State Parks. Call the park directly for more information about these non-reservation sites. Are in addition to the park day-use fee. 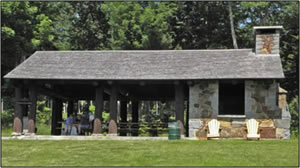 Group Picnic Shelter - is covered by a roof. Group Picnic Site - is open air - not covered by a shelter roof. Resource Room available for additional $150. Free Adobe Reader software to download PDFs.